Interior Cupola. Macedonian Orthodox Church. Image©Ruth Lor Malloy 2011. Wow. I thought the free, ethnic festival frenzy would cool down after Labour Day, but no. This weekend has at least 21 free events from which to choose. 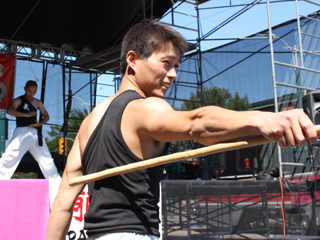 Cultures include Asian, Canadian, Celtic, Creole, Egyptian, Ethiopian, Japanese, Macedonian, Romanian, and the very multicultural Dragon Boat races. 1. The Night Market continues Friday and Saturday evenings in the Spadina Chinatown, but I don’t recommend it unless things have changed since my earlier visit. Not much to sell. Let me know. Last Supper. St. Mark's Coptic Church. Image©Ruth Lor Malloy 2011. 2. The Macedonian Orthodox Church has its annual festival in Markham. This is the church we visited last year with the amazing paintings covering almost every square inch of wall and ceiling inside. The three-day event will give you an opportunity to see the art work and maybe even meet the artist. It should be fun with dances, music, and food. It’s easy to get to from downtown. Markham GO station is across the street. 3. 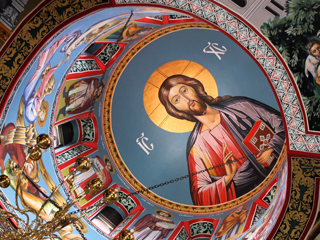 St. Mark’s Coptic Orthodox Church is hosting its annual festival in Scarborough. It’s Friday, Saturday and Sunday, too. Here you can sample genuine Middle Eastern food, and buy books and crafts. 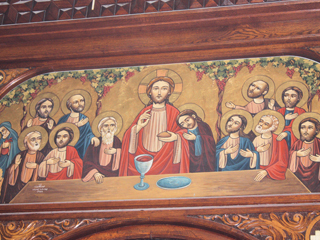 Its museum, the only Coptic museum outside of Egypt, will be open for guided tours. There’s a talent show and choir concert in the evening. Its religious art is unique. 4. On Friday, those interested in Japanese culture can attend a symposium on new writing from Japan, with Japanese and Canadian novelists and poets on hand. This will be at the Japanese Foundation downtown. 5. 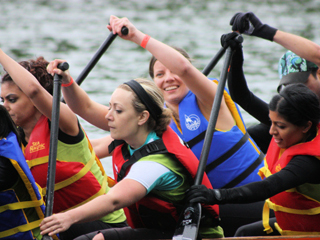 On Saturday and Sunday, the Great White North Dragon Boat races will be at Marilyn Bell Park. That’s west of Ontario Place at Lakeshore and Dufferin. You don’t have to line up to take a ferry for these races like you do the summer races. You might have a problem finding cheap parking nearby. These races are especially fun if you know the competitors. The races are short and well organized. Look for boats with multi-racial racers, and both men and women. Look for boats with senior racers. Dragon boating is all inclusive and lots of fun. No wonder it’s one of the fastest growing sports in the world. There will be bleachers, food, and shopping. 6. 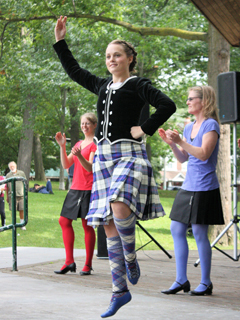 On Saturday and Sunday, Kew Beach is the site of a Celtic festival. The setting is green and lovely. The dancers are great, but I didn’t see any male dancers last year. You might want to take your own chair. 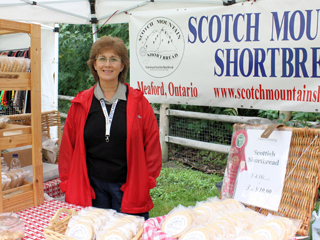 Vendors were selling DVDs, Celtic dance shoes and wigs, Scottish shortbread, and British foods and flags. The Good Manners Brigade had a stall attempting to re-introduce good manners. 7. Christie Pits will host Ethiopian-Canadian Day on Saturday. This site is easy to get to. It’s just outside the Christie subway station. I was there early in the day last year. A service of the Ethiopian Orthodox Church took place. The costumes and music were fascinating. 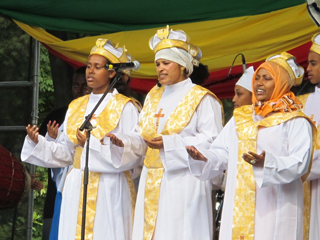 Ethiopian Orthodox Church Choir. Image©Ruth Lor Malloy 2011. I missed out on the dances and cultural show which were later. I did learn a lot about Ethiopia. It had a display about its emperors, scientists, and authors. Emperor Haile Selassie is considered a Rastafarian god! A booth focused on the country’s political prisoners. It was well worth a visit as everybody was friendly and answered questions. 8. The Romanians will be at Mel Lastman Square on Saturday. Their festival will be a first for me, so I don’t know what to expect. The Square is right at the North York Centre subway station. A Romanian church is the organizer. 9. 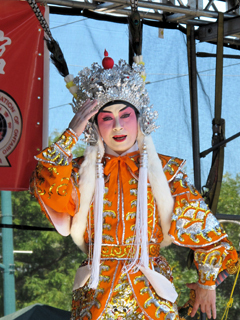 The downtown Chinatown will have its annual festival on Saturday and Sunday. It will be squeezed along the east side of Spadina between Dundas and College. Street cars on all sides will still be operating. It will be crowded. The performances last year were okay, but not great. This year, there will be kung fu demonstrations from the source of this martial art, Shaolin Temple in China. They should be exceptionally good. If last year was an indication, food stalls from many Asian countries will draw the crowds. The “stinky tofu“ might force many people to cover their noses. Never mind. It’s a Chinese delicacy that tastes better than it smells. You might want to try it, if you have the patience to wait in line. 10. The Ballet Creole will have an Open House on Saturday. It will give free dance lessons and demonstrations. 11. Fort York will be free after 1pm on Saturday for a commemoration of the 1777 Battle of Brandywine. This took place in Pennsylvania, a British victory. Can anyone tell me why this battle is celebrated in Toronto? 12. On Sunday, the Ethiopian New Year will be feted at Yonge-Dundas Square. An announcement I picked up at the Lalibela Restaurant on Bloor Street West said this would continue until dawn. Please let me know if it does. I don’t know what’s going to happen, but it sounds like a lot of excitement and fun. Karen Millyard Teaches Country Dancing. Image©Ruth Lor Malloy 2011. 13. 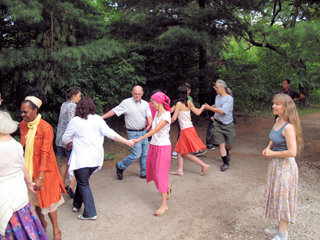 Another class on English country dancing will be held in High Park on Sunday. The last one attracted about 30 people and was a lot of fun. Dances were easy to learn and you can pretend you’re living in Jane Austen times. Because it has live music, participants pay what they can. For details like times, locations, and web-sites, please visit my web-site: www.TorontoMulticulturalCalendar.com. As you tell us of more events this weekend, we’ll put them on the Calendar, and on our Twitter. Our Twitter and Blog can be accessed easily from this web-site. on “till dawn.” It would be a first for a festival aside from Nuit Blanche. I will make the change on http://www.TorontoMulticulturalCalendar.com . Happy Ethiopian New Year. Ruth. Hi there, Just would like to clarify that the event in High Park this Sunday is social dancing rather than a class, but the dances will be easy and no dance experience is required — all welcome! And we’re a friendly bunch, so we change partners at the end of every dance, so there’s no need to bring one, though your friends are welcome too! Thanks for the clarification, Karen. It was a lot of fun dancing with your group. Ruth. It was great to have you with us, Ruth! We hope you’ll join us again soon.